The Developer Relations team at HERE had a busy week at CES, with a positive outcome noted for developers. 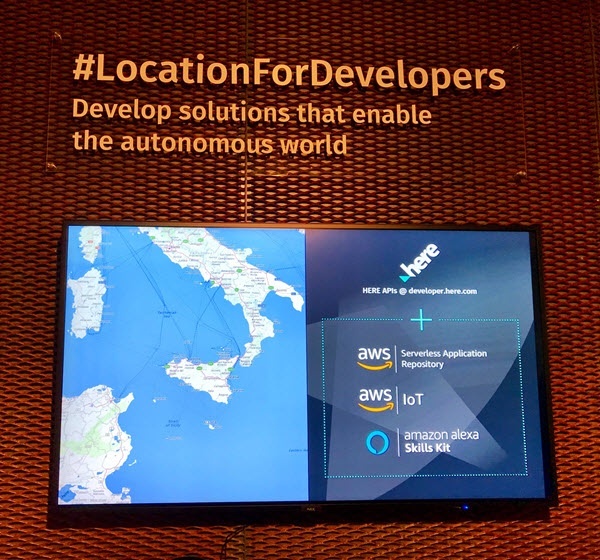 Among the many offerings we had to display, I was proud to have produced a demo showcasing voice control over our HERE Maps API using Amazon Alexa. As attendees approached, we would ask where they were from, and instruct Alexa via an Amazon Echo to show on the map their city or country. We also used voice commands to zoom in and out of the map. This post will assume you have a general understanding of the developer resources available from Amazon, and a degree of experience developing skills for Amazon Alexa. For more information, please visit Getting Started with the Alexa Skills Kit. "Show me Phoenix, Arizona "
"Go to Palermo, Sicily "
"Display Las Vegas, Nevada "
In each utterance above, the verb highlighted in bold represents the intent of the user. 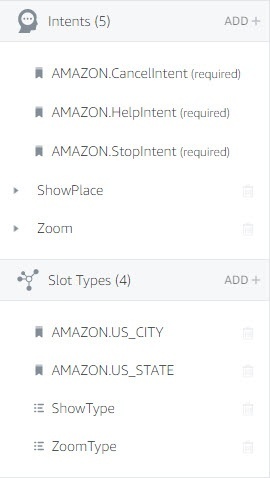 The location highlighted with an underline is the slot of data we are acquiring from the user. In this demo, I defined ShowPlace and Zoom as intents, as shown in the interactive model designer. To understand the above from a developer's perspective, consider lines 3-10 in the schema above. Essentially, we want to map this somewhere to somewhere in code to a function like showPlace(place,region). While there is not a direct mapping, you will see how this is accomplished soon. Likewise, for lines 28-31, a functional code equivalent could be setZoom(behavior), where behavior indicates 'in' or 'out'. Once the design of the skill is complete, it is time to code the skill. The function above is very similar to the previous function. It obtains the values provided by the user, performs validations, and then invokes the postMQTT function on line 15. One interesting difference is noted on line 4 - the use of the slot ID. Previously in this post when examining the 'types' section of the interactive model schema, note the IDs provided for the two ZoomType values: PLUS and MINUS. This is handy when I want to know the behavior in code, not necessarily the word spoken by the user. For example, whether the user says "Zoom in", "Zoom down", or "Zoom closer", the value of the ID in each case is PLUS. 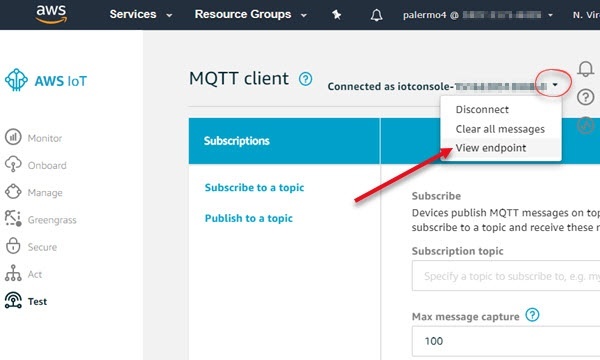 This is what is passed to the subscribing MQTT client. Line 1 is for your benefit in reading the code as the variables were declared elsewhere but used above. Of significance to what we have seen so far is the function declared on lines 77-93. Notice the message parameter contains a payloadString property. This contains the values sent from the lambda associated with the Alexa skill. 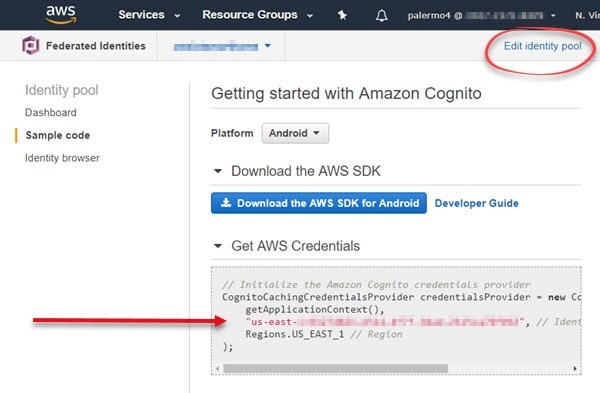 You can either get the identity pool id by selecting the 'Edit identity pool' link or take it from the Get AWS Credentials code sample on the screen. In this post, we showed how it is possible to add voice control to allow a different way to interact with HERE Maps. 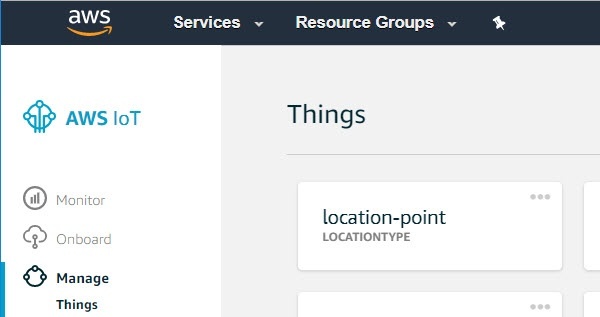 We examined briefly how to construct the voice interface for an Alexa Skill, how to manage functionality in the associated lambda, and how to wire up the lambda and client to communicate via AWS IoT. Happy coding!